No matter if your imminent event is to celebrate a wedding, birthday, divorce, retirement, emigration, anniversary, graduation, promotion or simply a friends getting together, we appreciate how important such gatherings are. Hence, we take the responsibility of arranging and delivering your event very seriously. The event itself though will be FUN from start to finish. Your Butler, or Model / Tutor will be carefully selected and not only look the part they are (all) talented/experienced in their speciality working hard to make your event as enjoyable and memorable as possible. We’ve fantastic Venues across the UK in City Centres, Towns and more remote areas. We can often take an event to your own home/holiday hire. The events themselves are easy to arrange and FUN from the very start - but whilst delivered “Tongue in Cheek” - they are all presented “in the best possible taste”. QUALITY is our watchword and entertainment our aim. From the very start, we take the worry away from you with a simple, reliable booking and straight forward payment procedure. Don’t forget that our extremely attractive (per head) pricing includes everything you’ll need, including a suitable venue close to you (if required). Once your Butler, or Tutor/Model is with you - you’ll know that your worries are over as they expertly lead your group through the memorable, fun event planned especially for your group. 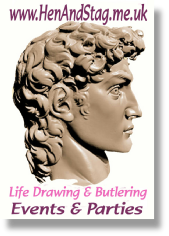 If you don't believe your eyes - then why not see some of the comments we’ve received from grateful Stags, Hens and companies for whom we’ve recently designed and delivered Life Drawing, Butlering or “Combined” Events? Of course, you can also pick up pearls of wisdom on our Facebook, Twitter and other social media feeds by following the links around our site. When it’s all over, you will ALL be left with a raft of happy memories and for the Life Drawing attendees, around half a dozen at least “vaguely human” looking sketches to share with friends afterwards! Your art will always a big hit “back at the office” or with friends!